Domus was built by Diamonte Corporation in 2002. 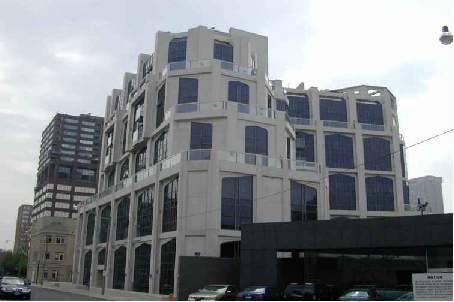 The Modern Gothic inspired10 storey building consists of 69 beautiful loft style suites The builder won The 1998 Project of the Year Award from the Greater Toronto Homebuilders Association. No two floor plans are the same yet all share large windows, nine foot ceilings, beautifully designed kitchens and bathrooms, hardwood floors, and opaque glass walls. Because the suites have no hallways, room sizes are maximized. Due to multiple setbacks, some suites have terraces while others have small balconies. This building located just out side Yorkville, at Bay Devenport inter sersection. Suite Mix: One and two storey suites ranging in size from 645 to 2732 square feet. Larger suites have fireplaces. Two-storey suites feature sculpted circular staircases, resembling a grand mansion.. If you are interested in Buying, Selling, or Renting, or interested in the current Listings 3 McalpineCondo, please feel free to call me or send an email.